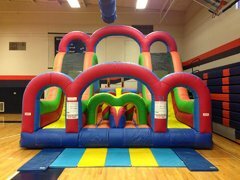 Obstacle Course Rentals Leap Joy Inflatables has fun and challenging Obstacle Course Rentals that are perfect for birthdays, school and church events, fundraising, graduations, and corporate events. 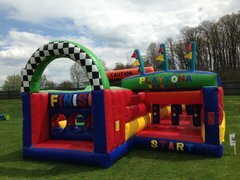 Inflatable obstacle course rentals not only provide hours of entertainment but a little friendly competition. What better way to get people moving and having a great time then by racing through an obstacle course? 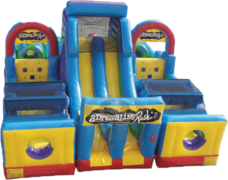 Your guests will go through a series of physically challenging elements and be able to jump, play and laugh. There will be jumping, climbing, crawling, ducking, dodging, and sliding! Obstacle Course Rentals area great way to show a large group of people a lot of fun. Take a look at our awesome party Games! Inflatable Twister is a huge hit with kids and adults, its a funky twist on a classic game we all love. 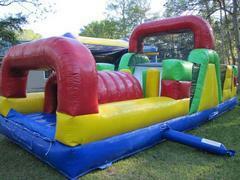 Leap Joy Inflatables is proud to serve Statesboro, Ga and surrounding areas with clean and affordable bounce house rentals. Customer satisfaction is our top priority and we guarantee your rentals will be clean, sanitized, and on time. Our rentals are all day and not just for a few hours, we want you to enjoy your rental all day. 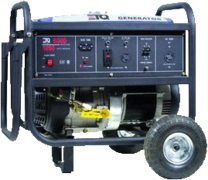 We also offer free delivery within 20 miles of Statesboro! Delivery outside of this area is subject to a fee. Leap Joy offers a "pick up and save" option as well. When you call to reserve your rental make sure to mention if you are military, associated with a school or church, or hosting a fundraiser; we offer discounts! Contact us today!